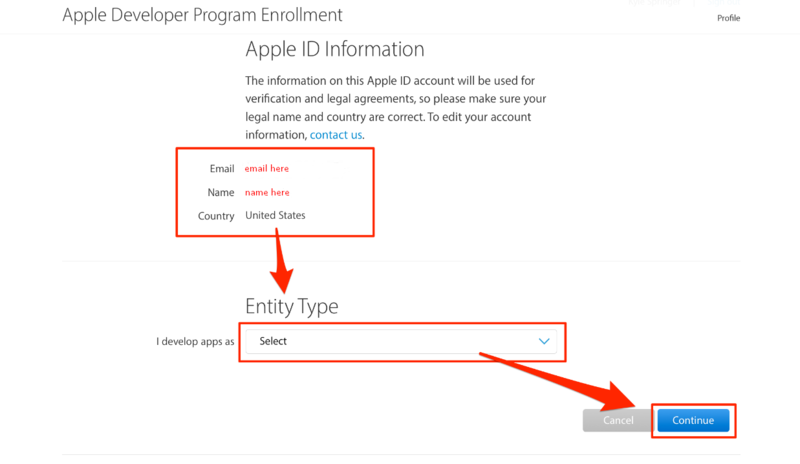 A step-by-step guide on how to create your Apple Developer account for your iOS app(s). The Apple Developer Program is what gives you the ability to make your app available on the App Store for iOS users. Due to Apple's guidelines and policies, you are required to setup your own developer account for your app to be published. The good news, however, is that because the app will exist under your account, you will have more control over it and it will maintain your business' branding on the App Store listing. Now, let's get on to the steps for how to create an account. IMPORTANT: Apple now requires everyone enrolling in their developer program to own an iOS device, so if you don't already own one you will need to purchase one. Before you create an Apple Developer Account, please make sure you’ve upgraded your app. You can do so by clicking on the green Upgrade button in the top right-hand corner. Step 4: Read through the agreement, check the checkbox confirming that you’ve read it, then click submit. Step 5: Confirm that your email address, name, and Country location is correct, then select one of the options from the Entity Type drop-down. Important Note: The Developer name listed on the iTunes App Store is based on the type of account selected from the options below. Apps published to Individual Developer Accounts will display the name listed on the iOS Developer Account. Apps published to Company/Organization Developer Accounts will display the Company Name entered within the iOS Developer Account. If your app is branded to your company then you will need to enroll in a Company/Organization developer account under your company's name. If your app is branded to you as an individual, then you can enroll in an Individual developer account. Enrolling in the correct developer account type helps keep your app and account in line with Apple's guidelines and will help in the submission process. Individuals or companies without an officially recognized business ( a company without a Dun and Bradstreet number). This account only allows for a single primary login to be created to the iOS Developer Account. Also, the developer name that will be made public (on the App Store) will be your First and Last name. If you would prefer a business name to show as your developer name, you will need to setup your account as a Company/Organization. Legally recognized Companies with a Dun and Bradstreet number can select this option. This will allow multiple user logins to be created and managed with varying permissions capabilities for each login. If your app is branded to your company (as opposed to an individual) then you will need to enroll as a Company/Organization, and in order to do so, you will need to provide a Dun and Bradstreet (DUNS) number. If you’re uncertain as to whether your business has a DUNS number, then you can check to see here. If don’t have a DUNS number yet, it is free to get one, and you can obtain one at this page. If you need help with obtaining a DUNS number, you can follow the steps found here. That page also has instructions for organizations outside of the United States. Step 6: Enter in your contact information. 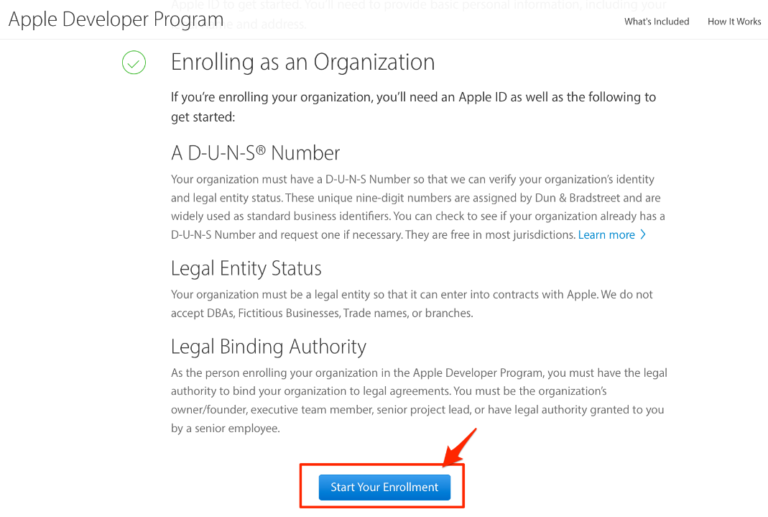 Step 7: Read the Apple Developer Program License Agreement. Check the box confirming that you’ve read it, then click Continue. 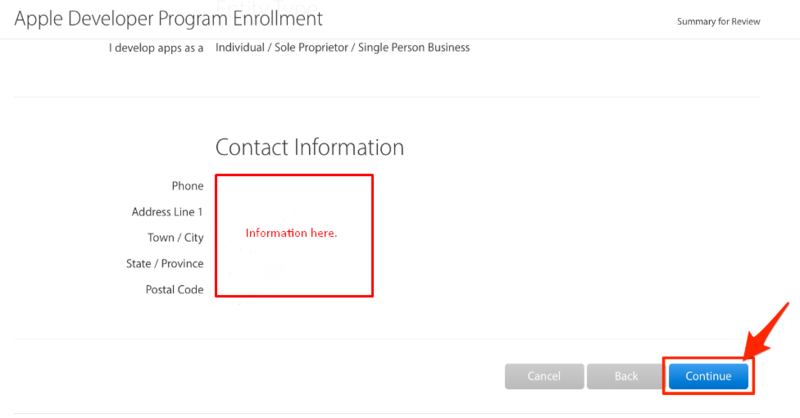 Make sure that the Apple ID information, entity type, and contact information are all correct, then click Continue. …but if you’d like to not worry about renewing your plan each year, feel free to check the box. 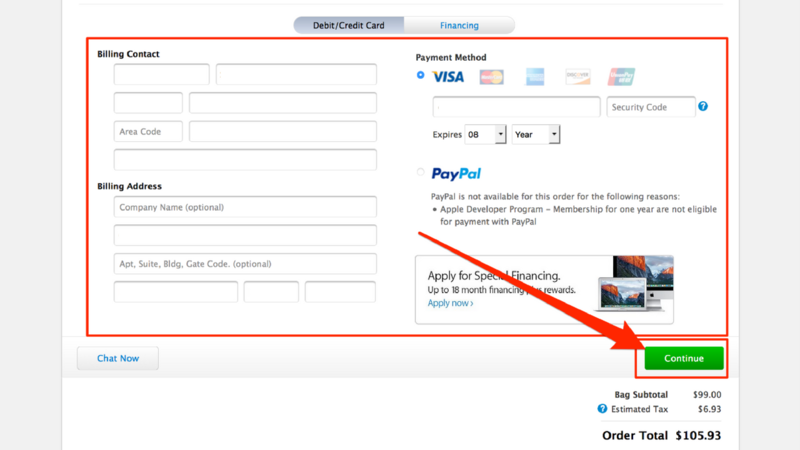 Then click Purchase to move onto paying for your developer account. Step 9: On the next page, sign in with your Apple ID. Step 10: Fill in your billing information then click Continue to finalize your payment. Step 11: Finish filling out the rest of the information on the rest of the screens. Within 24 hours, Apple should send you an email confirming that your Apple Developer Account has been created successfully. 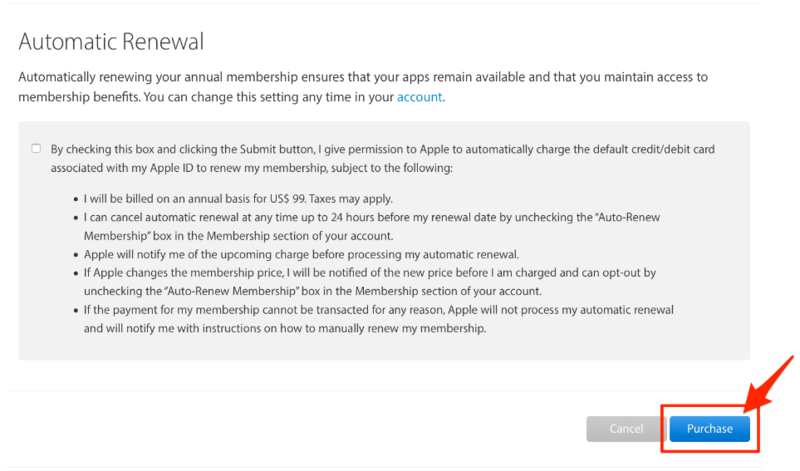 In order to publish on your behalf to your iTunes account, we will need full access to your developer account. As such, we require YOUR username and password for your developer account. This information needs to be uploaded to the Publishing Information page on your Control Panel (see below). At this time, there is not a separate user permissions setting that will allow us to fully publish on your behalf. Thus, please be sure to send us your credentials once you have fully setup your account. Nonprofit organizations, accredited educational institutions, and government entities based in the United States that will distribute only free apps on the App Store can request to have their annual membership fee waived. Click here for more information and to see if you qualify. If your app is intended for internal communications, processes, data, etc., you can leverage an Apple Enterprise Account to do so. ....so long as they 1) apply to your business, 2) are not the same in nature or intent and 3) adhere to Apple's terms and guidelines. I’ve published my app. What should I do next?